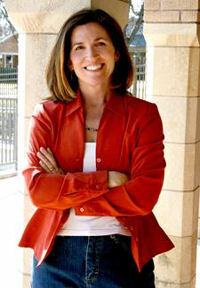 Clare Vanderpool was born in Wichita in 1964. If you ask anyone who knows her, they will tell you that she has a very strong connection to place. She lives in Wichita, Kansas, about four blocks from where she grew up, in an old neighborhood called College Hill. From her house she can walk to her parents' house, her sister's house, the school she went to and where her kids also attended, the pool, the sledding hill, and two bookstores! While she does have a college degree in English and Elementary Education, her best education has come from reading, listening to family stories, looking out the car window on road trips, pretending to be pirates with her brother, and just plain imagining. Besides writing she likes to go to the pool with her kids, browse at the bookstore, have a neighbor over for tea, watch re-runs of Monk, have a lot of kids at her house, and go out for dinner with her husband. Life is good. The movement of the train rocked me like a lullaby. I closed my eyes to the dusty countryside and imagined the sign I knew only from stories. The one just outside of town with big blue letters: MANIFEST: A TOWN WITH A RICH PAST AND A BRIGHT FUTURE. I thought about my daddy, Gideon Tucker. He does his best talking in stories, but in recent weeks, those had become few and far between. So on the occasion when he’d say to me, “Abilene, did I ever tell you ‘bout the time…?” I’d get all quiet and listen real hard. Mostly he’d tell stories about Manifest, the town where he’d lived once upon a time. “If I listened harder”—I closed my eyes as I kept rowing— “I suppose it would sound kind of happy and full, like Benny Goodman and his band playing ‘In the Mood.’ It would be music you’d want to dance to.” I kept my eyes closed, trusting Early to guide me if I started rowing off course. The great black bear, awesome as Ursa Major, wagged her head from side to side, and her bellow shook the nearby passage of the Appalachian Trail. I say her, but the truth is we had no way to tell. There were no female markings. No cubs in sight. But I knew. I knew her like I knew my own mother. It was in her bearing—her absolute authority over us two boys locked in her gaze. And it was in her unwavering will to keep us alive. She raised her body upright, to her full height. MacScott shot again, hitting the dirt just in front of the bear’s massive paws. He must’ve been shaken—he’d missed. He cocked the gun on more time, took careful aim, and pulled the trigger. It only clicked. Empty.